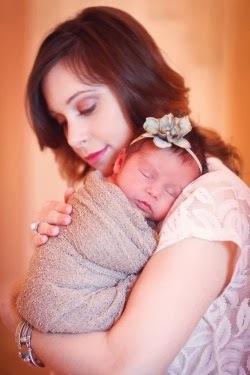 I can't believe that baby Jewel is turning 2 years old! Where has all the time gone? It truly seems like yesterday I found out I was pregnant with her on Josselyn's 1st Birthday. These last 2.5 years have been a whirlwind but they have been the best years of my life and I wouldn't trade my beautiful-mess of a life for anything. Lets get to the good stuff! 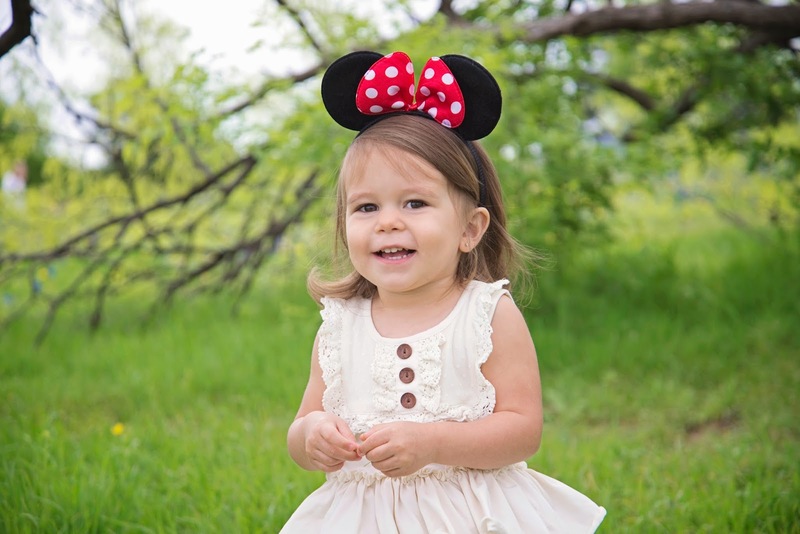 I had actually decided to forgo a birthday party for Jewel and instead put the $ towards taking a family trip to Disneyland to celebrate her 2nd Birthday (she is obsessed with Mickey & Minnie Mouse) So we booked 3 days in Disneyland & 3 days at the beach the first week in May to celebrate our baby girl. 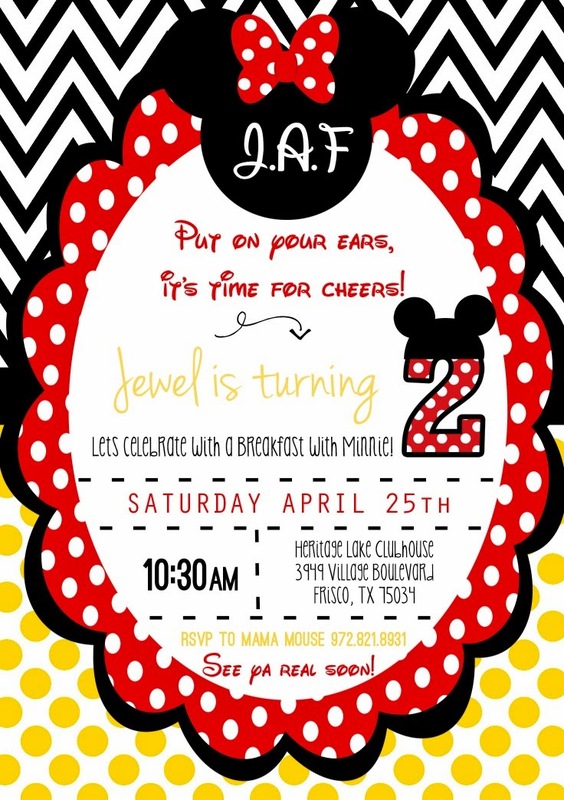 As time passed I started to feel a little bad that I wasn't planning a party for my baby, especially when we started getting invitations for 2nd birthdays left and right! So very last minute I decided I was going to try and pull something together. Usually I plan parties 4-5 months out but it was already March but the time I decided that the party was a go so I had about a month to pull it together. My first decision was what color scheme was I going to go with! I spent a week deciding between the pink Mickey Mouse club house looking Minnie or the more classic red Minnie Mouse. I decided to go with red becasue it is so timeless and I figured I would have plenty of red nick-knacks left from last years A Circus Birthday Party we did for Jewel, plus I had some red bowls, platters, etc from Josselyn's A Cowgirl Birthday Party. 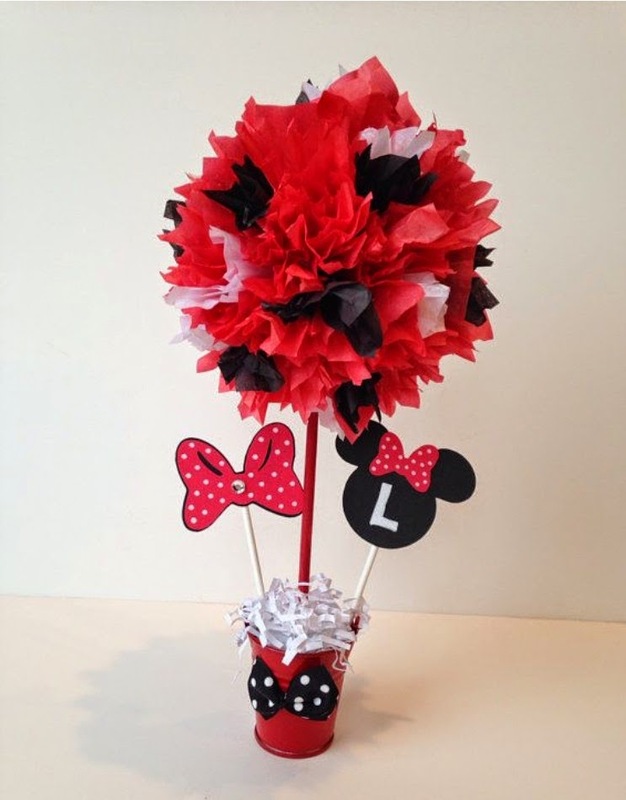 Well, come to find out red Minnie Mouse decor is nearly impossible to find!!!! Everything is PINK!!!! 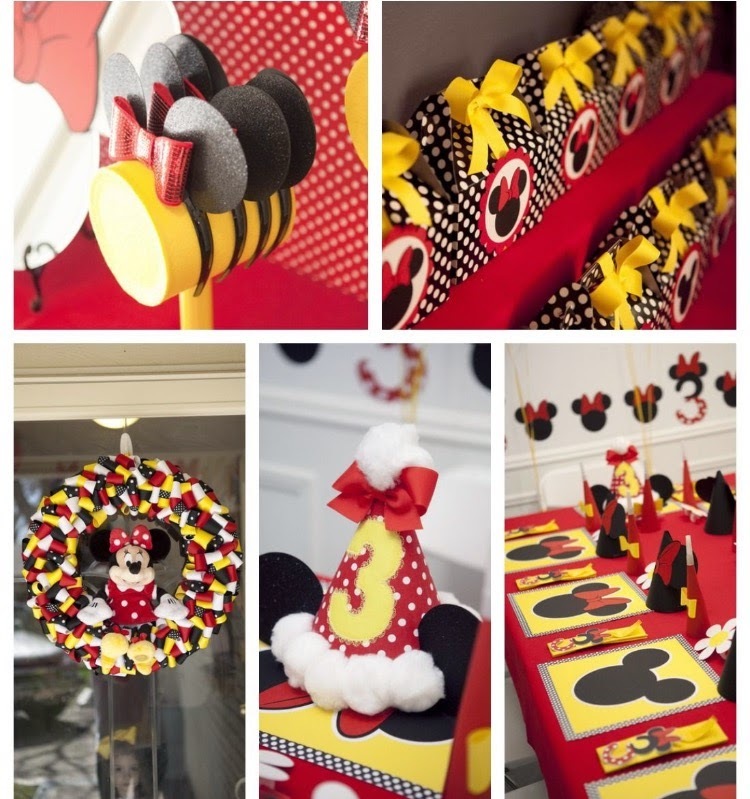 Had I to do over I might would have gone with the pink route but I just fell in love with all the red, black & yellow Minnie Mouse parties I found on Pinterest. I did throw in a splash of pink since Jewel decided about 2 weeks ago that her favorite color is pink haha! Here are a few of the looks that inspired this party. 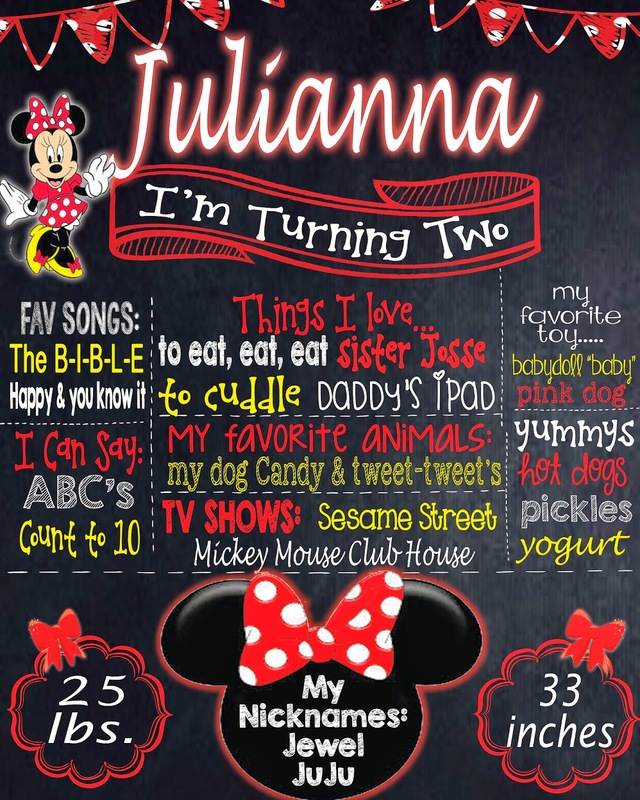 I have a slight obsession with birthday banners and I have made countless banners with my Cricut. I am not sure I have the time to make 3-4 banners like I usually would but hopefully I can spit one out or I'll just end up ordering an overpriced one from Etsy haha. I also love the look of fabric strip banners and I am 90% sure my mom or I can recycle the one I used for Jewel's 1st Circus birthday! I love balloons at a birthday party! I use the ballroom in my moms neighborhood clubhouse for the majority of my parties and becasue it is such a big somewhat bare room. I use balloons to set the theme and make decorating easy on me. When I incorporate balloons I feel like I can go very minimal on all the other decor because the balloons give off a wow factor and make everything look so festive. I fell in love with the Minnie Mouse ears arches I kept seeing online!!! We are for sure having one of these with a big red bow. I searched high and low for red Minnie Mouse plates but did not have any luck. But after searching I actually liked the whole polka-dot look better! Lucky for me, polka-dots are super easy to find everywhere!!! I found countless cute food items!!! 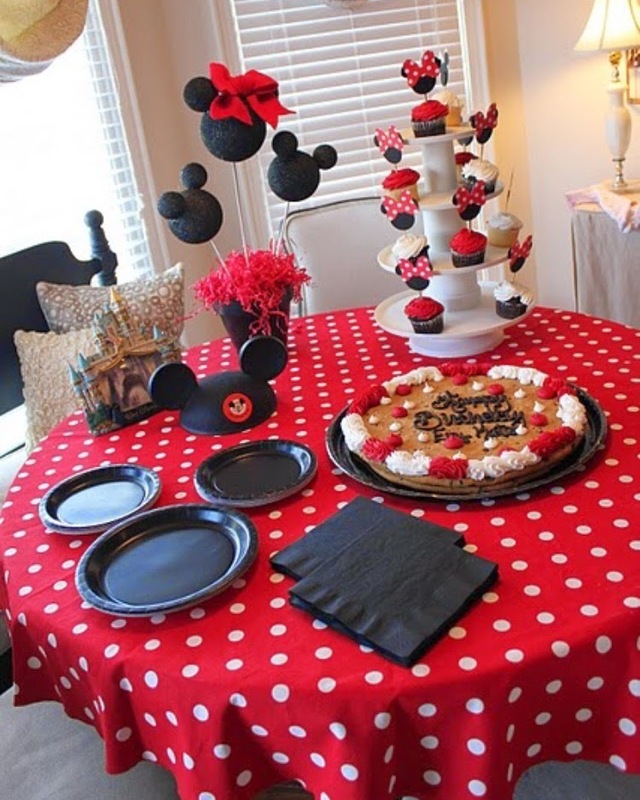 But the one must have is Minnie Mouse pancakes, I mean this is a breakfast with Minnie after all! 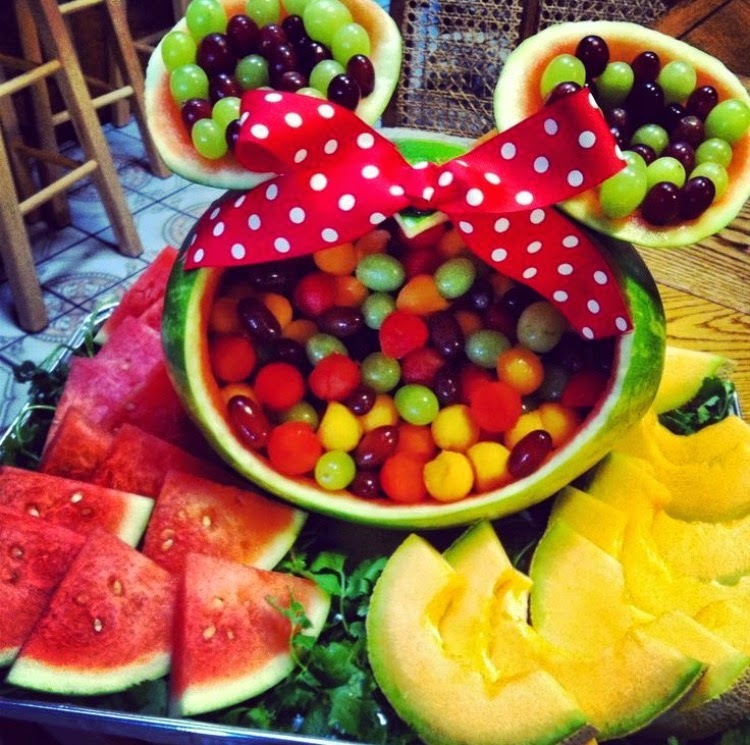 I also fell in love with this Minnie shaped fruit bowl. 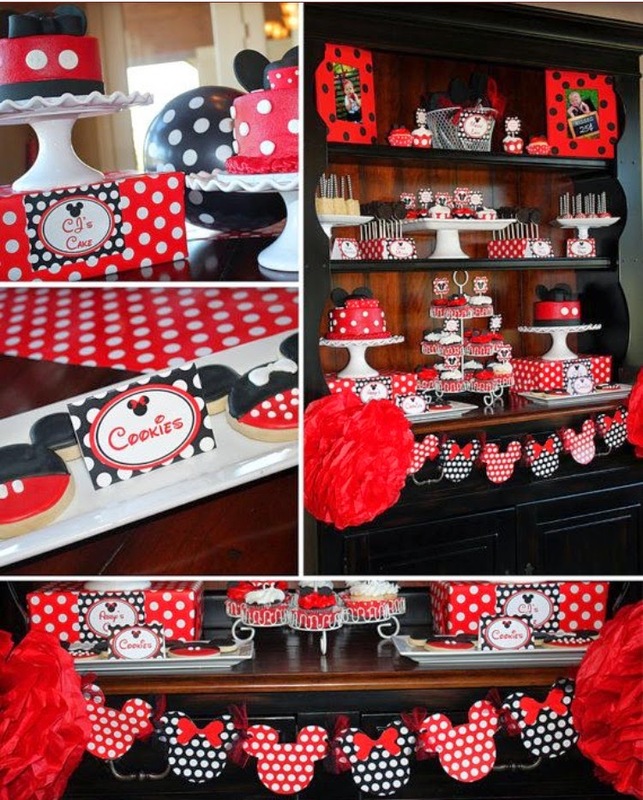 I also am a sucker for desserts so I have to do a couple sweet treats (I promise I will not go overboard) And cake-pops are a must since my spoiled girls get them daily at Starbucks #momfail So here are some of my favorite Minnie inspired sweets I came across on Pinterest. I use to not be a cake fan because I would rather have a variety of desserts but the more I do parties the more I fall in love with cakes! A cake can really bring home the theme for a party! I found so many cakes I adore on Pinterest. The hard part is going to be deciding which one. All I know for sure is that it has to be red with some polka-dots and a big bow with ears on top. I learned my lesson at Josselyn's 1st birthday about doing elaborate party favors when I ended up taking home 10 extra sand buckets filled to the top with goodies! My group of friends and family are the best that they come, but these folks do not know how to RSVP lol which is totally fine!!!! The only problem is I do not know if there will be 10 kids or 30 kids at Jewel's party so I just keep the party favors super simple that way it is no big deal if I have a million left over. I know I want to have Minnie & Mickey Mouse ears for the kids and maybe a color book or something like that to take home. I am basically a sucker for personalized onesies/shirts and tutu skirts or petticoats so Jewel and big sis will be in something of that sort! The good news is whatever the girls wear for this party they can also wear in Disneyland. 2 birds with 1 stone is a win! I knew I wanted invitations that would set the theme for the party so I searched for something with red, black & a little yellow! I loved how they turned out. And ofcourse a little monogram on top! There you have it...my party inspiration board! I sure hope this thing comes together and turns out even a fraction as cute as these pictures! Honestly I am so excited to spend a morning celebrating my little Jewel. Julianna Faith aka "Jewel" "JuJu" truly is our angel baby. She was by far the best SURPRISE of our life. She came at a time when I was dealing with feelings of loneliness, insecurity, uncertainty and the list could go on. A huge part of our life was in a constant transition and I had no clue how I was going to handle a 19 month old and newborn. And although the past 2 years were hard, this little girl saved my life in so many ways. God gave me an beautiful, strong, independent, feisty first born Josselyn. And I think He knew I needed a soft, sweet, cuddly 2nd baby that needed me to just slow down, surrender and hold her in my arms. Instead of being sad at the changes that continued to go on in our life, I was content and happy holding and caring for my angel baby & her big sis. Although you don't know it, you got me through a tough season in my life my little Jewel. Thank you for giving me something to hold on to every day these past 2 years. You have helped make these last 2 years simply beautiful and I love you with every ounce of my being. You will always be my BABY. "I'll love you forever, I'll like you always, as long as I am living my baby you'll be"
How beautiful!! Your Minnie mouse party completely made me grin. Your daughter is a cutie. 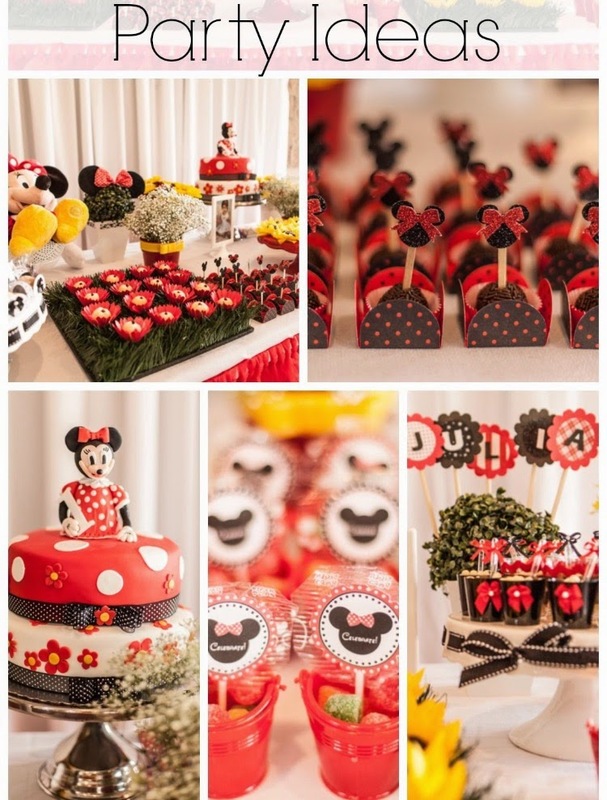 Can you please suggest some spacious party places Miami where I can host such a grand Minnie mouse party on my daughter’s birthday?